This is a crazy story about the European Starling: in 1890, this bird was brought from Europe to New York's Central Park by a group of Shakespeare enthusiasts who wanted America to have all the birds that Shakespeare ever mentioned. What!? In the past 100 years their population exploded and they are now considered an invasive species. But as the All About Birds site states: 'Though they're sometimes resented for their abundance and aggressiveness, they're still dazzling birds when you get a good look." I couldn't agree more! 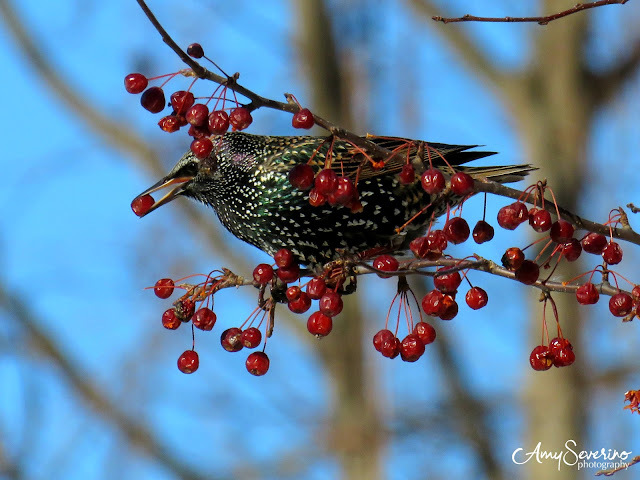 Just look at their winter plumage above and in these photos below! Gorgeous winter plumage aside, how about those "murmuration" videos that go viral on social media!? Yup, you guessed it: starlings! 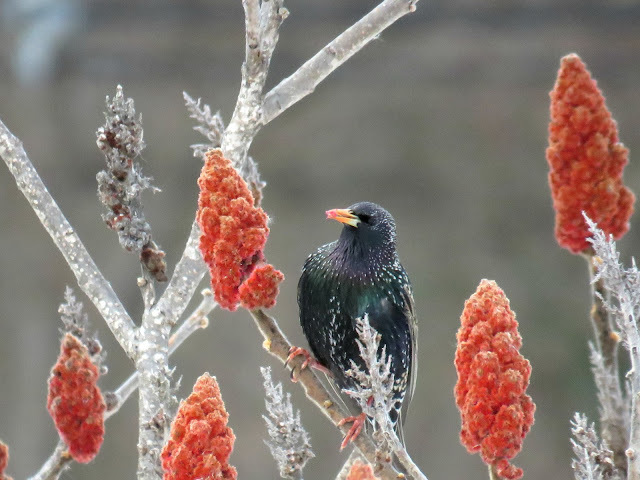 Recently I even obtained my own anecdote about starlings. Two weeks ago, I picked my son up from taking his SAT test. As we were walking to the car, a flock of starlings flew over that was so big, it cast a shadow. I said, "oh look, starlings!" My son looked up, and promptly received a little gift, on his nose from one of those starlings! He was a really good sport about the whole episode, and naturally I shared the old superstition that it is good luck to have that happen! Today's earrings, for my daily challenge during A-Z, are this pair of peyote tube beads. Don't forget to comment for a chance to win a week's worth of earrings. Drawing to be held after the A-Z challenge is complete! I hope you will join me for the letter "F" tomorrow! 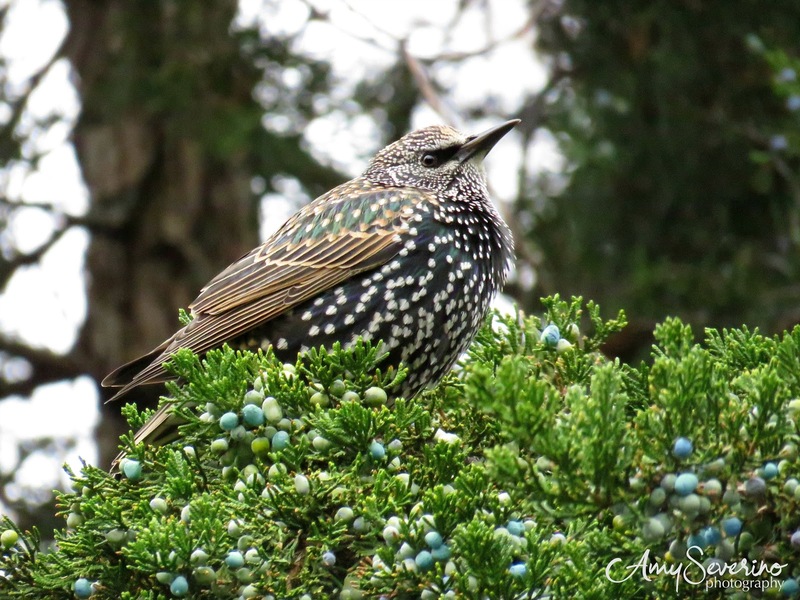 The European Starling is a pretty bird, but when I see them I can't help but think of all the native birds they have made life harder for. Species introduction, purposefully or inadvertently, creates ecological nightmares. Your son certainly was a good sport! There is a Far Side comic "how birds see the world". It's an aerial view where it shows two people with bullseyes on their head, and a dog with a bullseye on his back. I am so impressed with all of your lovely earrings. 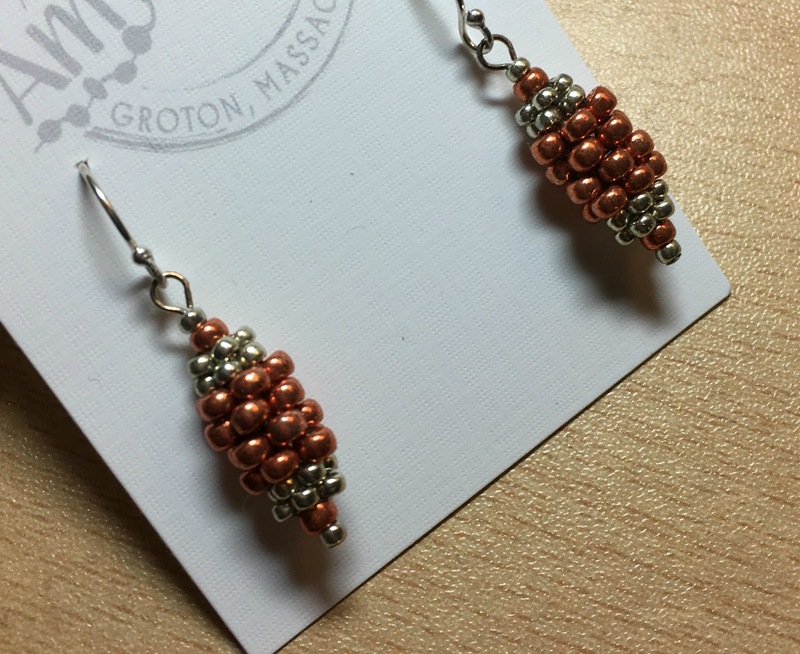 A daily pair of earrings made from seed beads is no small feat. Bravo! As the Steve Earle song says, "We are all immigrants" and I guess that holds true for animals too! That little "gift" may have been a sign of high SAT scores?! ?